The Beckman Institute hosted a reception honoring the five 2014 student awardees, Victoria Cross, Genevieve LaBelle, Qian Yin, Brennan Payne, and Vuong Le. “One of Arnold Beckman’s favorite sayings was ‘excellence in everything.’ In that fine tradition, we’re proud to recognize these five excellent students,” said Art Kramer, director of the Beckman Institute, as he welcomed guests to the Beckman Institute’s first annual student awards reception. 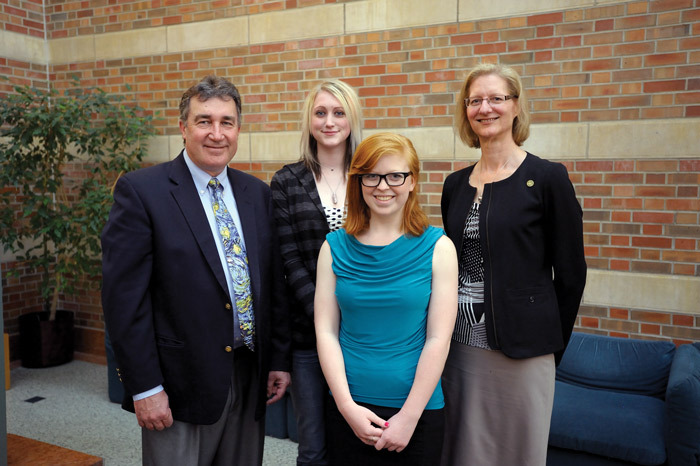 On Saturday, April 26, five students were honored for receiving one of the three annual Beckman student awards. Nadine Barrie Smith Memorial Fellowships were awarded to Ph.D. students Qian Yin and Genevieve LaBelle, the Erik Haferkamp Memorial Award for Undergraduate Research to junior neuroscience major Victoria Cross, and the inaugural Thomas and Margaret Huang Awards for Graduate Research to Ph.D. students Vuong Le and Brennan Payne. During the reception, the families of Erik Haferkamp and Nadine Barrie Smith, as well as Tom and Margaret Huang and their family were able to meet the awardees, their parents, and their faculty advisors. “I’m so incredibly honored to get this award,” said Cross, who works in Justin Rhodes’ lab to study the genetic and environmental factors that affect behavior in clownfish. Erik was a senior undergraduate student in Justin Rhodes’ lab, a budding neuroscientist double-majoring in psychology and molecular and cellular physiology, at the time of his death at age 22 in 2010. His family and friends established a fund in his memory to continue to support undergraduate research in neuroscience at the Beckman Institute. LaBelle and Yin, recipients of the Nadine Barrie Smith Fellowships, are both graduate students in the field of medical imaging, which honors the legacy of Nadine, who earned all three of her degrees at the University of Illinois—a bachelor’s in computer science, a master’s in electrical engineering, and her Ph.D. in biophysics. Nadine was well-known for her research in medical imaging and therapeutic ultrasound, and she was also passionate about advancing women in science and engineering. In her memory, her family, including husband and former Beckman researcher Andrew Webb, established the fund to support female graduate students researching in medical imaging. “Though I never met Nadine, I’ve heard and read many inspiring stories about her. She is a role model to me,” said Yin, who, after her grandfather died of liver cancer, dedicated her career to help develop new biomedical imaging methods to diagnose and treat cancer. For LaBelle, this fellowship will allow her to stay at Beckman over the summer and research full-time in Brad Sutton’s lab, where she works on improving the speed and quality of magnetic resonance imaging technology. 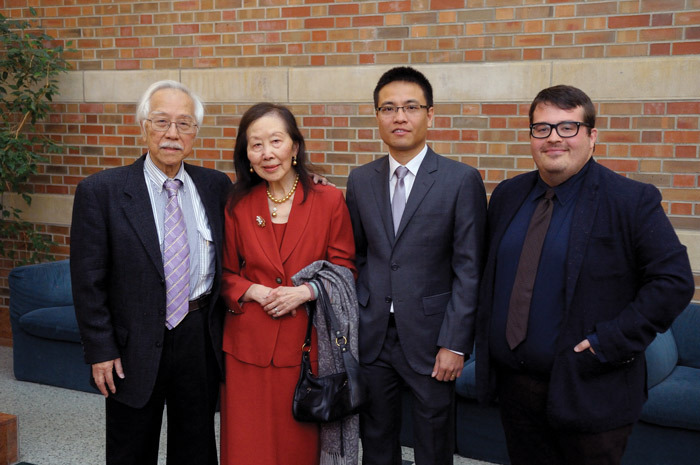 The Thomas and Margaret Huang Award was created by former students of Tom Huang, an electrical and computer engineering professor who was a founding member of the Beckman Institute and has mentored more than 100 Ph.D. students in his career. The award, given to graduate students in the Human-Computer Intelligent Interaction (HCII) research theme, honors the contributions both he and his wife Margaret have made to society. Payne will receive his Ph.D. in cognitive science and teaching and learning and then transition immediately into a postdoctoral research position at Beckman because of this award. He will work with Kara Federmeier to advance his studies in understanding cognitive changes associated with aging in older adults. One of Tom’s students, Vuong Le, also received the award, and will continue as a Ph.D. student in electrical and computer engineering to work on 3D modeling techniques for improved image analysis and understanding. These three annual awards are supported by generous contributions throughout the year. Find more information about donating. 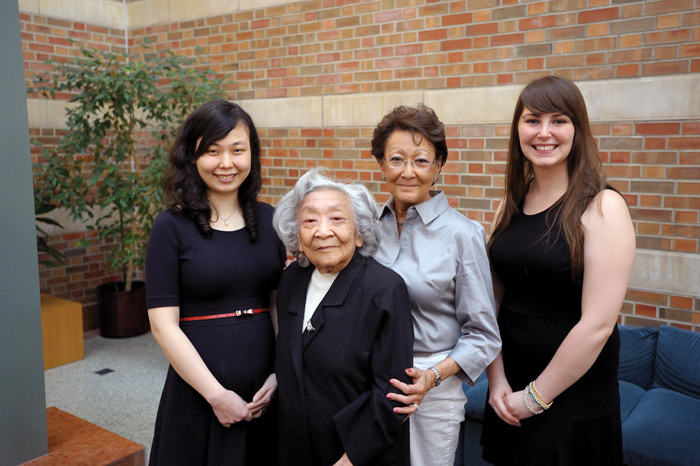 From left to right: Qian Yin, fellowship recipient; Jean Smith, Nadine’s mother; Arnette Bosch, Nadine’s sister; and Genevieve LaBelle, fellowship recipient. Qian is pursuing a Ph.D. in materials science and engineering and working with Jianjun Cheng and Wawrzyniec Dobrucki from Beckman. Genevieve is pursuing a Ph.D. in computer engineering and works with Brad Sutton in the Magnetic Resonance Functional Imaging Lab. From left to right, John Wilson; Beth Haferkamp, Erik’s sister; Victoria Cross, award recipient; and Bonnie Haferkamp, Erik’s mother. Victoria has been working with Justin Rhodes in his Behavioral Genetics Lab. She is a junior majoring in neuroscience. From left to right: Thomas Huang; Margaret Huang; Vuong Le, award recipient; and Brennan Payne, award recipient. Vuong is pursuing a Ph.D. in electrical and computer engineering under the direction of Thomas Huang, who leads the Image Formation and Processing Group. Brennan will receive his Ph.D. in cognitive science and teaching and learning in this summer. He has been working in the Adult Learning Lab with Elizabeth Stine-Morrow, and plans to work with Kara Federmeier and Stine-Morrow as a postdoctoral student at Beckman. This article is part of the Spring 2014 Synergy Issue, a publication of the Communications Office of the Beckman Institute.